ATOPICA (cyclosporine capsules USP) MODIFIED is an oral form of cyclosporine that immediately forms a microemulsion in an aqueous environment. 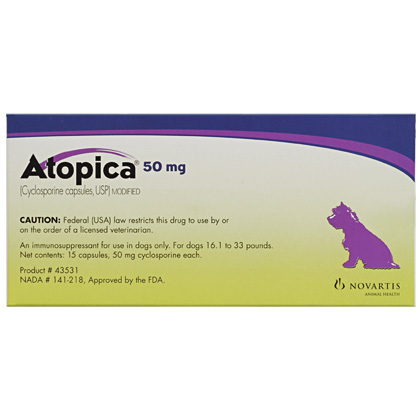 Cyclosporine, the active ingredient in ATOPICA, is a cyclic polypeptide, immune modulating agent consisting of 11 amino acids. It is produced as a metabolite by the fungal species Beauveria nivea. Chemically, cyclosporine A is designated [R-[R*,R*-(E)]]-cyclic-(L-alanyl-D-alanyl-N-methyl-L-leucyl-N-methyl-L-leucyl-N-methyl-L-valyl-3-hydroxy-N, 4-dimethyl-L-2-amino-6-octenoyl-L-amino-butyryl-N-methylglycyl-N-methyl-L-leucyl-L-valyl-N-methyl-L-leucyl).